Save the Bees! And wasps and hoverflies and ladybugs and butterflies…..
There’s a lot of attention to bees in the media lately: hive collapse, mass deaths due to improper pesticide use, the list goes on. But much of the “Save the Bees” attention is focused on the European Honeybee- a foreign import to this country. When you think of honeybees, you most likely think first to ‘honey’ and worry about a world without this natural sweetener…. but honeybees play a larger roll for agriculture: pollination. Bee farmers and vegetable/tree/fruit farmers work together to ensure solid pollination of crops, while harvesting natural sweetener. The potential loss of honeybees would be devastating to the food systems we have in place. But, there are OTHER bees who were here long before their European cousins – native, solitary bees!! They need our help too. Read on for 4 simple tips you can take to help your native bees plus a building guide for our mason bee house. Honeybees are colony bees: they live in hives surrounding one queen and make honey to feed future generations. Most of our native bees are solitary creatures – they forage on their own and lay their eggs inside holes in the ground, in rotted wood or in broken ends of pithy shrubs. They pack their eggs in with mud or sawdust and they are as varied as you can imagine, from teeny tiny Perdita Minima to the friendly and fluffy Bumble Bees. Bees are, in fact descendants of their protein hungry Wasp cousins, but prefer the sweet pollen of bolting radishes, apple blossoms, dandelions and other weeds to meat. I am by no means a bee/wasp/fly expert, but I do have eyes and ears and natural curiosity. 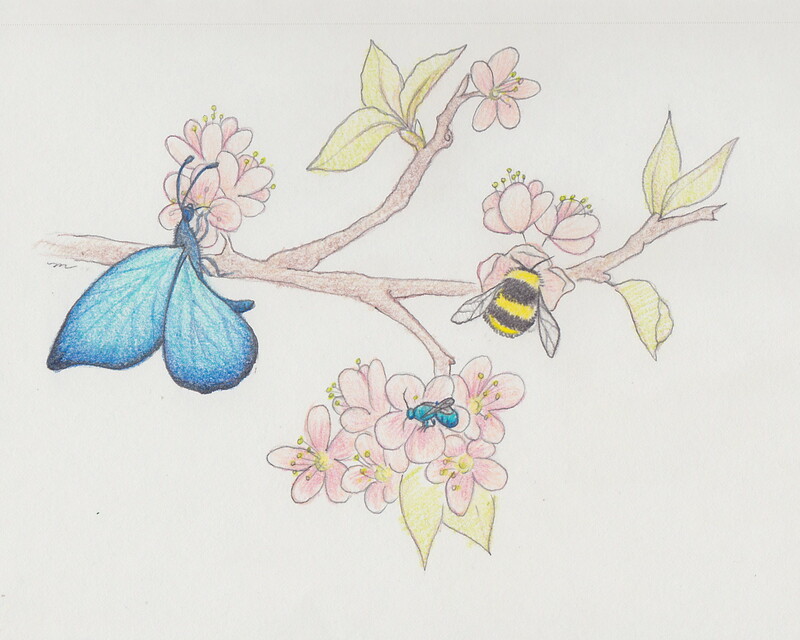 In early spring when the nights are still cold, I often find a single Bombus/Bumblebee perched on one of my fruit trees, deep inside a blossom or on a warm branch nearby. Still weak and sleepy, these friendly bees are just waking up and need early nutrition. In spring and summer when my lavender, catnip and mints are in full bloom, the sound of all the tiny to large native bees is deafening. Kneeling down to look closely I can count more types of pollinators than fingers on my hands: bees, ladybugs, butterflies, moths- all gorging on the bountiful feast! And in fall when the veggie garden is slowing down I allow lettuces, broccolis and radishes to bolt, offering a late season meal to the pollinators as they’re preparing their winter egg caches. Once you begin to observe the multitudes of tiny pollinators, you will surely want to do all you can to give them the best chance at life – for their sake and yours! 1. Broaden the Blooms: plant native flowers, shrubs and trees with staggered bloom dates and allow a few vegetables (like lettuce, radish and especially broccoli) to bolt in the garden. Native pollinators need food to be available in early spring, early winter and all seasons in between. Lavender and mint are easy to grow and highly favored by bumbles but they also need food as soon as they wake up: fruit trees bloom early, as do many wildflowers. They will also need a late season snack, too so include flowers and shrubs that bloom late and hold onto those blossoms until frost-killed. Bees love yellow, blue and purple. Butterflies love hot oranges and reds. Sunflowers are popular with bees and birds and the pernicious weed Queen Anne’s Lace is a favorite among hover flies. Research native plants particular to your growing zone and plant a wide succession of blooming times. 2. Home Sweet Home: Solitary bees don’t live in hives like honeybees: they prefer to bed down in holes or hedgerows. Put up bee houses in a sunny, East-facing location near your garden to attract the bees right where you need them. Bee houses can be as simple as drilling holes in a chunk of wood, stuffing teasel into an old can, or can be more crafty affairs. The key is to mount the house where it will get morning sunlight and to include assorted sizes of holes to offer vacancy to all sizes of pollinators. Unlike honeybees, mason bees do great in a greenhouse or hoophouse and don’t get trapped in the plastic/glass trying to escape. Bee habitat can even be as simple as a brush pile. Some shrubs have hollow/pithy branches when broken and make excellent egg depositories. 3. Quench their thirst: One of the most commonly forgotten requirements is drinking water. Bees can easily drown in open water buckets or troughs. Place marbles or stones in a birdbath or bowl so the bees are able to stand on the stones and drink safely without falling in and drowning. 4. Give Them a Kick Start: Found a bee that looks too tired to fly away? It probably is! Bees work hard and occasionally run out of steam. If you find a bee on the ground that looks too sleepy to move on, offer it a spoonful of sugar water – he’ll thank you for the extra kick! 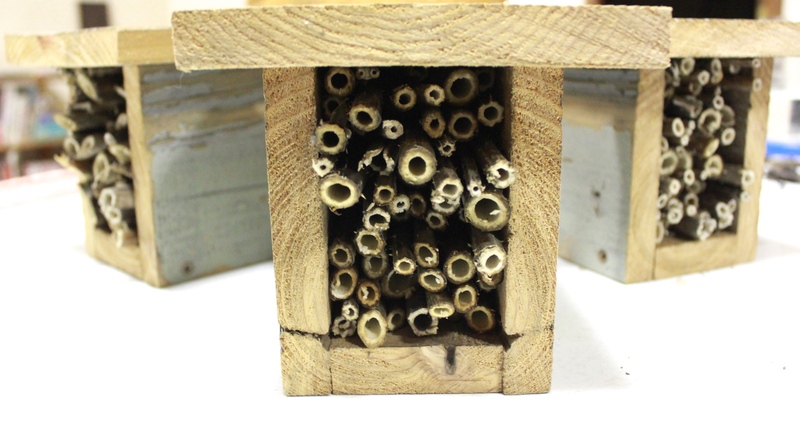 Our bee houses are made using recycled cedar siding and local, dry Teasel. Teasel is a weed found along the edges of pastures and ditch banks and looks a bit like a tall thistle. In the fall, the stems dry and are totally hollow. One Teasel stem can provide many sizes of tubs from top to bottom. They’re thorny, so wear leather gloves when handling them. Bamboo would be another great choice. The dimensions of these houses are not overly important: you want a top that protects the house from rain and it should be at least 4-6 inches deep to provide long tubes to fill with lots of eggs in the fall. Add a loop screwed to the back for hanging on a garden post or tree facing East. It may take a while for the bees to find their new house, so be patient. Hang them in the spring and hopefully you’ll have some new residents come fall! I found your website today when I was looking for, of all things, crochet produce bags! I am terrified of bees, but I know their importance, so I’m trying hard to get over my fear and help them along. Thanks, this bee (and other pollinators) info was useful.